TruFLOW Jr. return manifolds with isolation valves are used with either the TruFLOW Jr. modular manifolds with balancing valves or the TruFLOW Jr. modular valveless manifolds to complete the manifold set. 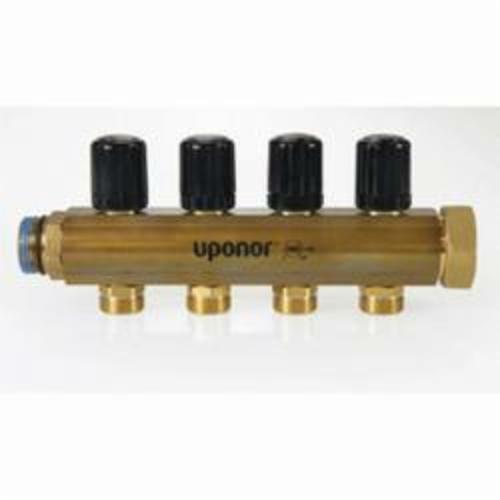 The TruFLOW Jr. return manifolds with isolation valves allow for manual isolation of the individual loops on the manifold. Manifolds are available in 2- to 4-loop configurations depending on model. The manifold body (1 in barrel diameter) ends have R32 threads as shown in the picture. Maximum recommended flow to the manifold is 14 gpm.